Thallus: crustose, usually well developed, +regularly areolate to rimose-areolate, 0.2-2 mm thick; prothallus: black, obvious at the margin of the thalli or indistinct or lacking areoles: contiguous, flat to slightly convex, irregular to moderately regular, 0.2-2 mm in diam. surface: whitish gray to pale bluish gray, esorediate cortex: 10-17 µm thick medulla: white, I+ intensely violet, sometimes medulla-I reaction not uniformly throughout the thallus (but usually more distinct under the hypothecium; rarely medulla I-) Apothecia: black, sitting in between and usually not overtopping the areoles, 0.4-2(-3.5) mm in diam., singular or in sometimes large and dense groups (then outline of apothecia angular) disc: black, flat to slightly convex, dull, epruinose to (usually weakly) pruinose margin: very thin or disappearing exciple: with an epihymeniumlike brownish rim and an unpigmented (50-80 µm wide, but often strongly reduced) interior part epihymenium: olive-brown, dirty green, bright green (cinereorufa-green), or dark brown, 10-15 µm thick hymenium: hyaline, 4375 µm tall, I+ blue; paraphyses: not or rarely branched and usually not anastomosing subhymenium: distinguishable only after staining with lactic blue, 25-80 µm thick hypothecium: unpigmented to very pale green or pale yellowish brown asci: clavate, 38-55 x 9-15 µm, 8-spored ascospores: hyaline, simple, broadly ellipsoid (rarely sub-globose) to oblong-ellipsoid, (5-)6.2-13.5(-17.5) x (2.5)3.6-6.7(-8) µm, length-width-index 1.2-2.4, mean spore volume 70-235 µm3 Pycnidia: immersed, graphidoid conidia: bacilliform, (6-)9-13(-18) x 1-1.5 µm [studied in 28 specimens] Spot tests: cortex and medulla K-, C-, KC-, P- Secondary metabolites: with 3 sympatric distributed chemotypes of obviously minor taxonomic rank: chemotype A: with confluentic acid syndrome; chemotype Substrate and ecology: in open habitats on acid and slightly calcareous rocks, including sandstones World distribution: bipolar and extending into the tropics in alpine areas Sonoran distribution: widespread and locally common from mid-elevations to the alpine and upper montane zones of Arizona, California, Baja California, Baja California Sur, Chihuahua, and Sinaloa. Notes: Lecidea tessellata is a very widespread and rather polymorphic species. 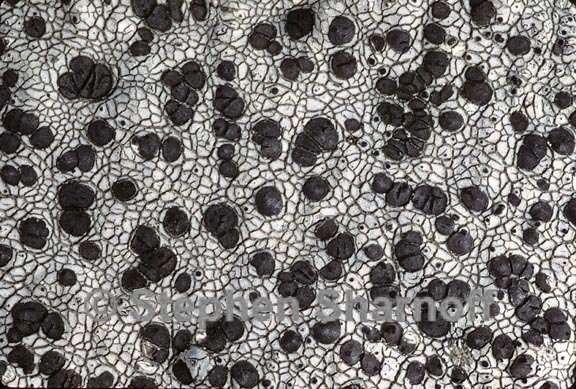 It is rather easily recognized by its regularly areolated, usually moderately to rather thick thallus with usually has a I+ dark violet medulla, its half-sunken apothecia with an mostly somewhat reduced exciple, its unpigmented hypothecium, and its small, thick-walled and blunt ascospores. The epitheton "tessellatus" (Latin) means "built of little square stones" (like a mosaic) and refers to the uniformly cracked areolate thallus. In alpine areas over calcareous rocks, one finds Lecidea tessellata var. caesia (Anzi) Arnold, characterized by a pale bluish gray thallus with a floury surface (see Hertel 1967). This variety is common and widespread in alpine areas with a more humid climate but not yet reported from the Sonoran region. Note: This is an artificial unit and includes all those taxa of still unclear generic position, that were described as members of the genus Lecidea, as circumscribed by Zahlbruckner and based primarily on the occurrence of hyaline, non-septate spores within lecideine apothecia. Finding a phylogenetically proper placement for the species is a project well beyond the scope of the development of this flora.